*NOTE - Please pay attention to pick up dates & times - these are the ONLY times, we do regret missing your bids but - Please DO NOT BID if you cannot pick up on these times, please call if you have any questions. 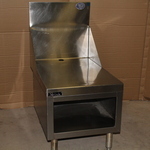 Stunning line up of quality NEW / Unused equipment here for auction. Some previously used but nice items have been addded, please look at description or ask if unsure. Partial list: Garland 10 burner range with double ovens, Hobart 60 quart bakery mixer / pizza dough machine, high output Ice Machine, Bakers Pride heavy duty flat top grill / griddle, 20 quart mixer, 30 quart mixer, 40 quart mixer, True 3 door refrigerator, double door freezer, 2 door refrigerator cooler, refrigerated salad / sandwich prep tables, under counter freezer, Single door freezer by True w/ split doors, Single door cooler, 1 door glass merchandising display freezer, various sizes glass door merchandiser coolers, Bar items including bottle cooler, kegerator draft / tap box, Deli meat Slicers by Berkel and others, stainless steel work tables and equipment stands in various sizes - some with backsplash, Butcher block wood bakery / dough table, stainless steel wall shelves and pot rack, Metro shelving, chest freezer, glass slide top ice cream freezer - dipping cabinet or novelty items, panini grill, hot dog roller grill, cotton candy machine, popcorn machine, bar sinks, food warmers, blenders, 3 bay sink, 1 bowl sink, ice bin, propane outdoor steamer / fryer, double burner outdoor gas stove, LED OPEN signs, conveyor toaster and commercial pop up, Robot Couple CL 50 Ultra E, Robot Coupe MP350 Turbo Combi stick blender - Large w/ interchangeable cutter / mixer and whip / whisk, various cookware and utensils, Knives. More to come - see auction for all items. *NOTE - We provide "Internet Pricing" as we found the prices from a variety of vendors by simply using a google search and is provided as a guide only. These are advertised prices for the same unit new on the internet which you can search for yourself. We try to find the lowest price offered but please do your due diligence on your own behalf. These are generally not "list" or "msrp" which are typically much higher or even double. 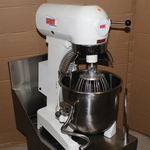 NEW Hobart 60 quart mixer - Awesome bakery / pizza dough machine! 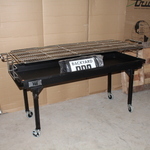 Base is 33" x 33"
(3″ Casters or 6″ Legs Optional) 3″ caster or 6″ leg option available at no charge when specified on order (in lieu of 6″ casters). Top mount, environmentally friendly refrigeration system. Balanced system for efficient operation even under severe conditions. Maintains product temperatures of 36˚–38˚F. Direct water line hook up w/ pour over option as backup. This automatic 12 cup coffee brewer with 2 upper and 1 lower warmer can brew up to 5.3 gallons per hour into standard, 64 oz. decanters. Its compact footprint, only 8 1/2" wide, makes the Bunn automatic coffee brewer a great addition for limited countertop space.